I’m really into the concept of food freedom and eating what I’m craving. I haven’t always been this way, though. There was definitely a time in my life (back in high school) when I thought a salad was the only thing I should order at a restaurant. It’s been a process over the years of figuring out how to fuel my body in a way that makes me feel good and also honoring cravings when they hit. Now that I don’t restrict what I eat, I generally feel the freedom to eat what I’m craving, eat when I’m hungry, and stop when I’m full. Like earlier this week- it was my 22nd birthday (woohoo!) 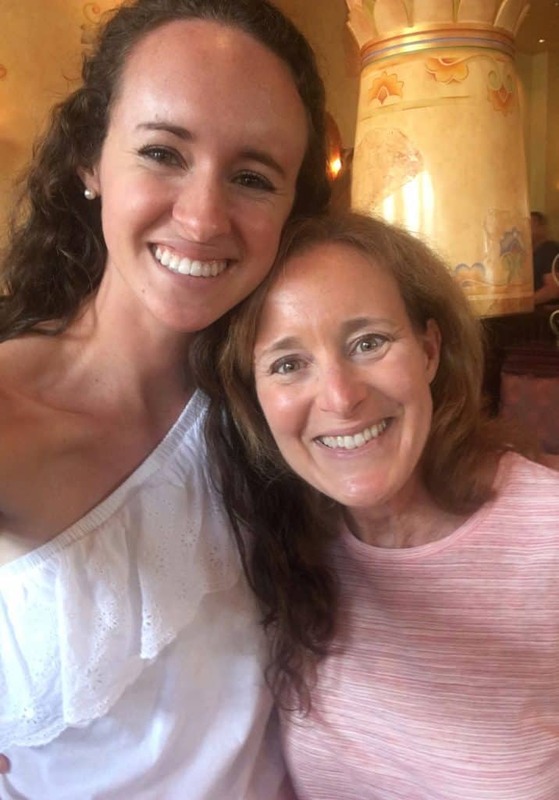 and I met my mom at the Cheesecake Factory that’s halfway between campus and my parent’s house to have lunch together. I got the dinner-sized portion of the four-cheese pasta for lunch, ate till I was full, and then boxed up the other half or so to take home. It definitely wasn’t the lowest calorie item on the menu, but it was awesome and I loved every bite. I do often crave salads and smoothies, but other times, all I want is a big bowl of cheesy pasta, you know? So, I order salads when I go out to eat sometimes, if that’s what I’m feeling and the restaurant has awesome loaded salads, but I also know it’s easy to make really good salads at home. 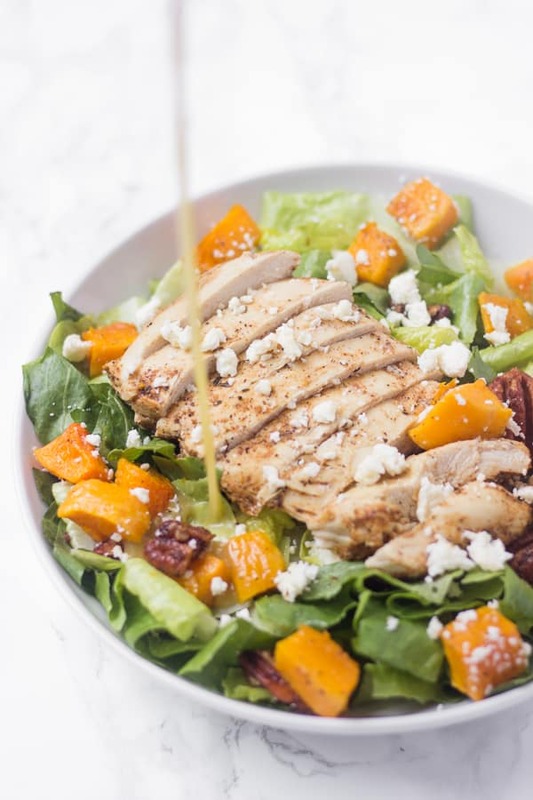 Like this harvest butternut squash chicken salad right here. It was an awesome restaurant salad that I ordered once on a salad-craving day and then re-created at home to enjoy again AND share with you! 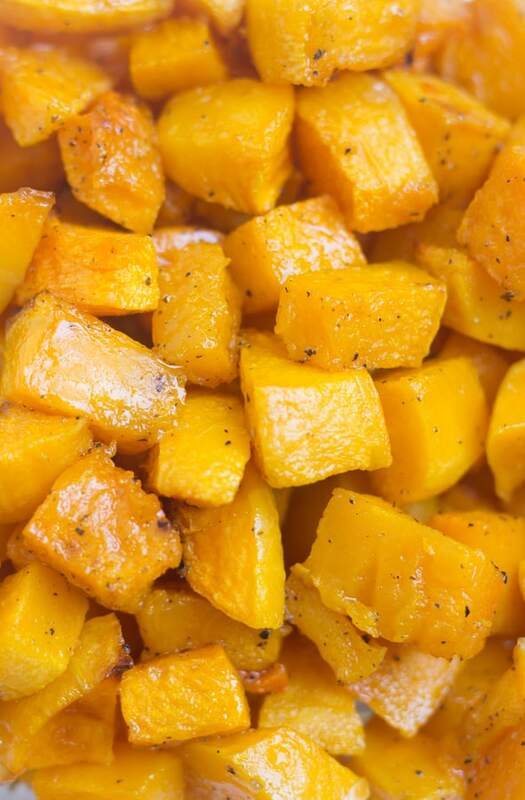 The star of the salad is the sweet, almost caramelized roasted butternut squash. There’s a restaurant in Raleigh that’s become one of my favorite spots to go for special occasions with my family when we’re all in town since 1) it’s delicious and 2) it has something that fits everyone’s dietary needs. Can I suggest making this ASAP? And if you’d rather have this salad as an appetizer because I made you start craving pasta, can I suggest this healthy fettuccine alfredo or one-skillet baked ziti? 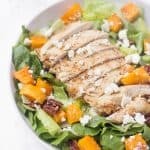 If you try this fall harvest butternut squash chicken salad, I’d LOVE for you to let me know in a comment or take a picture and tag me @livbane on Instagram. Hope you enjoy! Wash and dry chicken breasts. Pound to an even 1/4 inch thickness, and then place in a medium bowl and top with olive oil, lemon juice, and cajun seasoning. Cover the bowl with a lid, place in refrigerator, and marinate for 3-4 hours. While chicken is marinating, peel and chop butternut squash. Place on parchment-lined baking sheet, drizzle with a tablespoon of cooking oil, sprinkle with salt and pepper, and roast at 450 degrees for 20-25 minutes until soft and beginning to caramelize. While squash is roasting, wash and dry lettuce or spinach. Mix salad dressing ingredients in a jar or shaker container. Cook chicken in skillet in a tablespoon of olive oil over medium-low heat, for 3-4 minutes each side. 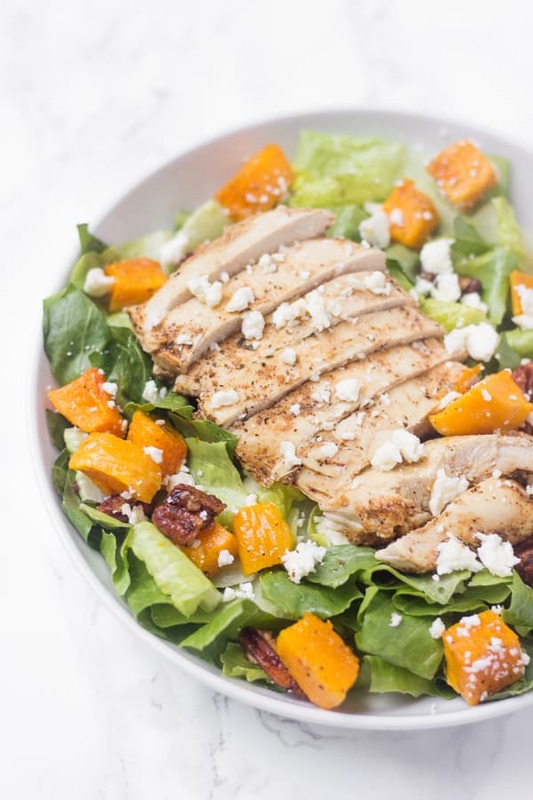 Place salad or lettuce in bowls, and then top with roasted squash cubes, nuts, cheese, and sliced chicken breasts. Serve immediately. If you love candied nuts, try using these honey glazed pecans instead of the regular nuts! It makes my heart sooo full and happy to see that you have come such a long way in feeding your body exactly what it needs and what it’s craving. <3 I love to hear about people's journeys to food freedom, and I love that our bodies just balance out (God is such an AWESOME Creator; He deserves all the glory! ), and sometimes we need a big bowl of cheesy pasta or a big fall themed salad like this one. I agree 100%! Thanks, Emily!! This looks so delicious. Butternut squash is one of my favourite salad additions! It’s delish! I think any roasted veggies are an awesome salad topping! This looks so yummy! I love salads and am always trying to try new salad recipes because I find they can get quite boring… I’ll have to try this! I’m excited that fall’s here and I can start adding chopped apples, pears, butternut squash, and so many other yummy things to my salads! I can’t believe I’d never thought of adding butternut squash to salads before…love getting inspiration from great restaurant dishes! Happy Belated birthday Liv! I love that you ordered what you were feeling at the cheesecake factory. 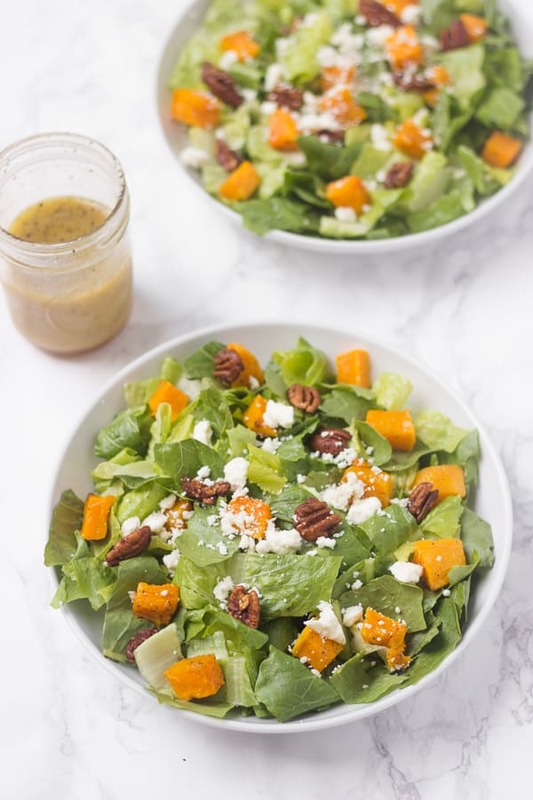 I also love butternut squash in salads – it’s the perfect fall addition! Thanks so much for the birthday wishes, Sarah! As much as I love butternut squash [which is a lot] I can’t believe that I have yet to put it in a salad! Going to have to give this one a try for sure! And that dressing – so simple yet sounds so delicious. Butternut is my favorite squash by far and I love how versatile it is! In pasta sauce, salad, on its own….so many delicious ways to enjoy it!